Data science is a discipline that arises out of the problem of analyzing and understanding big data sets. 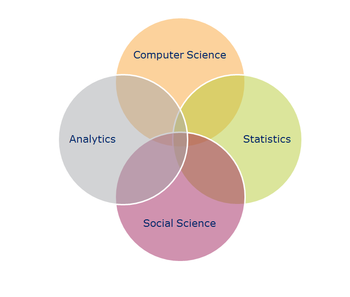 It is an interdisciplinary field that employs techniques from various disciplines such as mathematics, statistics, computer science,information science and business analytics.Techniques frequently used in data science include data mining, pattern recognition, data analysis and visualization, probability, machine learning, pattern recognition and so on. By utilizing these techniques, data science investigates problems in various domains such as marketing analytics, risk management, agriculture, public policy, marketing optimization, fraud detection,health care,public transport etc. In general, data science is transforming traditional ways of analyzing problems and creating new solutions. Over time, the techniques that data scientists use will evolve and become more sophisticated, allowing data science to tackle age-old challenges in new ways. Health care, urban living and business are areas data science can be seen in action today. The main challenge for hospitals with cost pressures tightens is to treat as many patients as they can efficiently, keeping in mind the improvement of the quality of care. Instrument and machine data is being used increasingly to track as well as optimize patient flow, treatment, and equipment used in the hospitals. It is estimated that there will be a one percent efficiency gain that could yield more than $63 billion in the global healthcare savings. Siemens uses data science to improve safety. Uber uses data science in all aspects of its' establishment. They think all companies can benefit from this in all processes. This includes; Manufacturing processes, the retail industry, the finances services sector as well as the travel industry. 1960: The term "data science" was first used by Peter Naur as a substitute for Computer Science. 1996: Members of the International Federation of Classification Societies (IFCS) met in Kobe for their biennial conference. Here, for the first time, the term data science was included in the title of the conference ("Data Science, classification, and related methods") . 2008: DJ Patil and Jeff Hammerbacher used the term "data scientist" to define their jobs at LinkedIn and Facebook, respectively. There is no standardized use of the term data science and it may mean different things to different people. Other terms closely related to data science include big data, statistics and business analytics. Jeff Wu argues that data science is equivalent to statistics therefore statistics needs to be re-branded to data science and statisticians to data scientists. William Cleveland views data science as a distinct discipline that has emerged from the field of statistics by incorporating other disciplines. IBM notes that data science complements big data, statistics and business analysis. Training in data science is similar to data analysis and business analysis. However, the data scientist is distinguished by strong business understanding and excellent communication skills. . The primary concern is that privacy advocates feel it is unethical if people are unaware that their data is being analyzed without their consent. This is not a big problem in science and health research because the regulatory framework is stringent. In other industries ethical standards are not yet mature and this poses a privacy risk. This is an area data scientists need to make significant contributions to avert cases of breach of privacy. Legal frameworks and policies need to be put in place. For example the NSA PRISM program to gather intelligence has been authorized by federal judges but it is debatable how misuse of this data will be forestalled. IBM SPSS - A software package used for statistical and predictive analysis. Apache Hadoop - An open-source software framework for processing very large datasets by utilizing many machines. The framework is able to use from a few to several thousands of machines to cope with growing amounts of data. Business intelligence software - Tools used for analyzing and visualizing data using reports, charts and dashboards. Cognos, Business objects, SQL server reporting services and Tableau are some of the tools used. ThoughtSpot - ThoughtSpot's Relational Search Appliance combines data from on-premise, cloud and desktop sources, and provides users with the ability to access that data with a simple search interface. Attivio - Provides search and discovery technology that integrates structured and unstructured information from various sources. Data Science in health care industry. Data Science has taken various dimensions in the world of health care industry. The branch which has a highly positive impact is the Pharmaceutical industry, which utilizes this facility to be compliant in regulations. Pharmacovilgilance (PV) is the practice of monitoring the effects of medications or drugs after they have been licensed for use, especially in order to identify and evaluate previously unreported adverse reactions. Data Science helps in many ways to identify the adverse reactions of medications and/or drugs and produce a insightful data which is helpful for pharmaceutical companies to identify unheard adverse reactions. 26 Feb 2013 @bigdataborat In Data Science, 80% of time spent prepare data, 20% of time spent complain about need for prepare data. ↑ http://www.cambridge.org/mk/academic/subjects/statistics-probability/statistics-and-probability-general-interest/truth-or-truthiness-distinguishing-fact-fiction-learning-think-data-scientist?format=AR "Howard Wainer: Truth or Truthiness: Distinguishing Fact from Fiction by Learning to Think Like a Data Scientist"
↑ http://projecteuclid.org/euclid.aoms/1177704711 "The Future of Data Analysis"
↑ http://www.naur.com/Conc.Surv.html "Peter Naur: Concise Survey of Computer Methods, 397 p"
↑ http://www.springer.com/us/book/9784431702085 "Data Science, classification, and related methods"
↑ http://www2.isye.gatech.edu/~jeffwu/presentations/datascience.pdf "Statistics = Data Science?" ↑ http://marketing.dice.com/pdf/Dice_TechSalarySurvey_2014.pdf "Dice Tech Salary Survey 2013-2014"